Teething can be totally terrible, or it can be completely easy and painless. It is important to remember that each baby has a unique experience with it. Despite being helpless, there are some things you can try to help your little one with this process. And, it’s important to be up to date on a few tidbits to build your background knowledge on the topic of teething if you are a first-time parent. Read on to “sink your teeth” into some important information! Check out this chart! It is a great resource for parents when it comes to keeping an eye out for teeth that are pushing through. 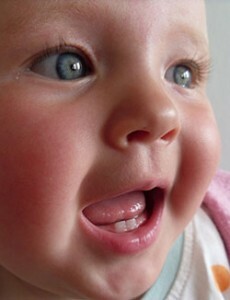 Generally, babies cut their two bottom teeth first. Then, the top two teeth push through, followed by the incisors. But, it is also important to know that the order is not definite for all children. In fact, some babies have been reported being born with a full set of choppers, while others cut teeth close to around their first birthday. While you can’t stop the eruption pain, you can certainly numb it. Anesthetic cream is great to have on hand (I had a tube stashed all over the house). 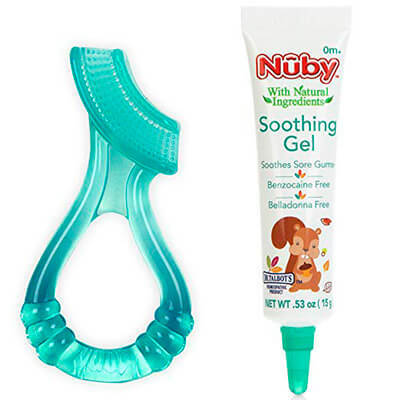 You can rub it on the gums and it instantly stops the unpleasant sensation. There are many great brands to try that contain all natural ingredients. Amber teething necklaces have grown in popularity recently. Available for moms or babies to wear; your child can chew away on the beads and ease their pain. 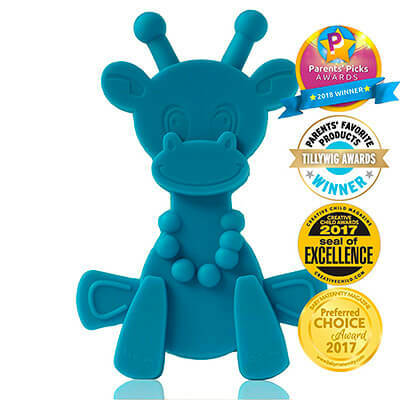 You can also have a teething toy that is designed to help the teeth cut through and allow your baby to focus on massaging their gums. Be sure to try a few different kinds! Some babies love ribbed textures while others prefer something that is smooth and squishy. And, if you don’t have a teether on hand, a good old finger will do (just make sure it’s a clean finger). Many pediatricians agree that your baby is more likely to wake up at night crying because their teeth hurt. So, their sleeping schedule (and yours) may be interrupted for a few nights (or even longer) until the tooth pushes through. Doctors believe that because the babies are more distracted during the day playing and being stimulated; they are less likely to notice the pain. But when things are still and quiet in the evening, they are more likely to feel the process. 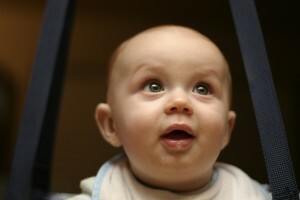 In many cases, a baby will drool (and drool, and drool) for weeks or even months at a time before a tooth erupts. While you can’t stop it, you can deal with it. Be sure to place a bib over the top of your tot’s tops to ward off moisture and keep your baby feeling comfortable and fresh. This may mean replacing a bib several times a day, so pick up a few extra packs during this developmental time. As soon a tooth erupts, begin to brush it twice a day. Not only will it preserve the health of the tooth, but it will help stimulate the gums and encourage more to erupt. Plus, the earlier you get your child used to the feeling of a toothbrush and the process of brushing, the more likely they will be to want to brush and will be used to the healthy habit by the time they are a toddler and are ready to brush on their own. Once the teeth erupt, it is wise to begin to give your baby their last bottle or a cup of juice an hour or so before bedtime. It is also wise to wipe off their gums with a cold rag or brush their teeth to remove any excess liquid left behind. When babies are sent to bassinet with milk or juice on their gums and teeth, the sugar from the beverage can cause bottle rot. Many babies suffer from this epidemic, and it can easily be prevented! Now that you are aware of some tips and tidbits about teething, you are sure to help your little one with this process and become more aware of signs, symptoms, and solutions to the developmental process.